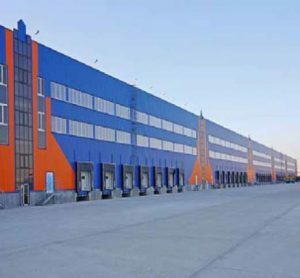 The Brovary Logistic Park consists of a 49,180 sqm GLA Class A warehouse and associated office space. The building has large facades to the Brovary ring road, at the intersection of the Brovary (Е-95/М-01 highway) and Borispol ring roads. It is located 10 km from the Kiev city border and 5 km from Borispol international airport. The building is divided into six independent sections (each at least 6,400 sqm), with internal clear ceiling of 12m height and industrial flooring constructed with an anti–dust overlay quartz finish. The terminal accommodates 90 parking spaces for cars and trucks, as well as 24 hour security. Upon entry into the Company, management succeeded to finish construction and fully rent the warehousing space at a 50% higher rent by the end of 2012. Following the war in Ukraine and the collapse of the Hrivnia exchange rate (dropped by 90% within 2014), SPDI exercised active management in tandem with its tenant partners, ensuring that Terminal Brovary lost only some of its tenants and was fully let again by April 2016. In October 2016 the Company announced it has signed a Sale and Purchase Agreement (‘SPA’) with Temania Enterprises Ltd for the sale of Terminal Brovary at a Gross Asset Value of over US$16 million (before the deduction of the outstanding EBRD loan. This compares favourably to the US$13.4 million gross value assigned to the Terminal as at 31 December 2015 and generated a net profit of over US$2.5 million net to SPDI and a net cash inflow of over US$3 million (see announcement of 9 June 2016 for further details). Linda Residence is a residential complex consisting of four low rise apartment buildings located in Bucharest, Sector 3, close to subway transportation which connects the property to all areas in Bucharest in less than 30 minutes. Situated in an upcoming residential area of the City, the units were well sought after and SPDI sold the bulk of them in May 2016, generating €450,000 net cash proceeds from the transaction.